Watermelon salad is so delicious and easy, we wonder why we never see it on restaurant menus. We eat it daily during the hot weather. The watermelon is so juicy and hydrating, we can’t get enough of it. We adapted this recipe from Mozzarella Company, one of the greatest American cheese makers and a NIBBLE Top Pick Of The Week. They use their delectable mozzarella. But feta or fresh goat cheese are equally delicious—even more so to those who like tangy cheese. Enjoy it as a light luncheon salad or as a first course at dinner. 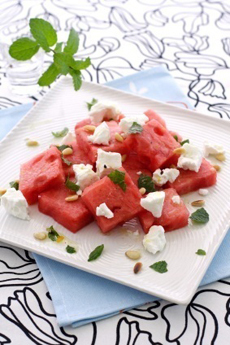 A delicious watermelon and feta salad with basil, mint and pistachio nuts. Photo by Lulu Durand | IST. 1. Toss the watermelon, tomatoes, mozzarella, salt, pepper, olive oil and half of each of the mint and basil leaves together. 2. Top with the remaining mint and basil leaves. 3. Makes 4 servings. Consider making a double batch—you’ll be wanting more! The history of watermelon plus more watermelon recipes.